This past week has marked the annual celebration of World Breastfeeding Week. Spread across the internet have been posts and articles from breastfeeding mamas. Their struggles and their joys have been out there to encourage each other and future mothers in their breastfeeding journeys. It is an amazing use of the internet and social media and I love seeing every single photo and story. My own personal nursing stories are long and winding and intertwined. Some chapters have been public and some have been kept private. They have spanned over eight years and will likely be drawing to a close in the very near future. As the years passed my nursing relationships evolved- from including others, (doctors, friends, lactation consultants, Papa) to being just between the two of us. Our practices changed as our needs changed. This growth has been as organic as life itself. Nursing has ebbed and flowed from one daughter to the next and from one stage onto another. The years and the moments have blurred, but the experience is as crisp as on the very first day. Stories of long term breastfeeding seem few and far between, but I suspect there are more of us out there than it would appear. By year three it is so second nature and so much a part of any given day that it becomes unnecessary to talk much about it, I suppose. For us, the necessity of nursing in public or even outside home, is so rare that the topic has rarely come up in the past few years. Having seen so many mothers sharing their photos this week I have been led to post this one I snapped last week. 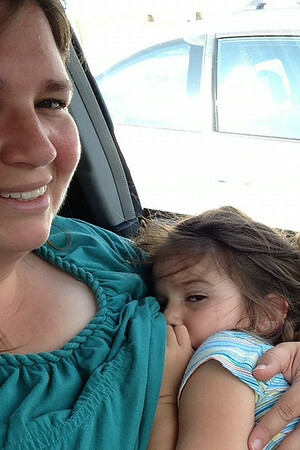 I share it to add to the growing collection of images and experiences that show the wide variety of normal breastfeeding. I hope that it helps to broaden that definition of normal. This entry was posted in Six Months on August 9, 2014 by Rebecca.